Jamaica Luxurious Private Transportation Services : Jamaican Airport Transfer, Vacation &Tours. Do you want to enjoy an unconcerned vacation to Jamaica? Experience the warmth of the island and the great hospitality of the people of Jamaica? The best way is to book or reserve your trip at JCV Transportation and Tours. JCV Transportation and Tours provides a variety of one way and round trips, hotel pick-ups, private airport shuttles or taxis. Our specialization lies thereby at personalized and private shuttles to or from your destination. 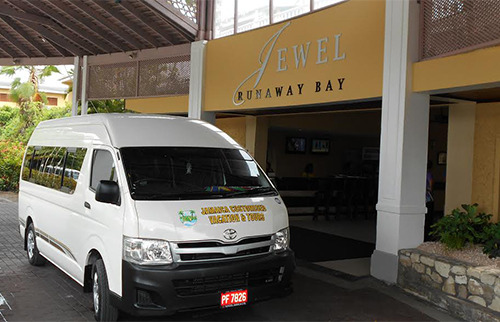 By making use of the latest most luxurious model Vans, Mini Buses, Limousines, Town Cars, SUV’s and Coaches, we guarantee a great Jamaica Vacation experience with the best private ground transportation and tour services. Due to over 7 years of experience and professionalism, JCV Transportation and Tours compiled a list of the best Jamaican Tours you can find on the island. We offer day trips, cruises, sightseeing tours, guided tours, wild life adventures, safari tours, fishing and many more. In other words, we offer the best excursions island wide to ensure you make the most out of your trip and provide you a once in a lifetime experience visiting Jamaica! • And more great Jamaican tours and attractions. • Water Sports activities from all major destinations in Jamaica. After all, who would not want to visit the “Land of Wood and Water”, the home of the legend “Bob Marley” and the fastest man alive “Usain Bolt”, once in their lives! So, do not hesitate to give us a call or visit our website. Visit Jamaica, and relax… book or reserve at JCV Transportation and Tours!